Vinyl has come a long way since it was first introduced to the flooring market. Vinyl is no longer just the traditional peel-n-stick sheets in your grandmother’s kitchen. Luxury vinyl flooring is the improved version of vinyl flooring and comes in luxury vinyl tiles (LVT) and luxury vinyl planks (LVP). Avant Garde Carpet One Floor & Home in Waldorf, MD is your local retailer for luxury vinyl flooring. Our sales professionals can help you navigate our selection and find the perfect floor for your home. Luxury vinyl is made from multiple layers and features a rigid core. Luxury vinyl is known as a resilient flooring option because of its slight cushioned feel underfoot and its ability to bounce back to its shape after being compressed. These are just a couple of features that set luxury vinyl apart from the rest. The durability of luxury vinyl depends on what is called a wear layer. The wear layer of luxury vinyl is a clear plastic film applied to the surface of the product. The thicker this film the more durable the floor is. Luxury vinyl has the ability to withstand heat, moisture, and heavy traffic. It is also resistant to mold and mildew, making it great for people with allergies and it even means you can install it in bathrooms and kitchens. Luxury vinyl comes in a collection of styles, patterns, and colors to match your home’s personality. From luxury vinyl planks made to look like hardwood to luxury vinyl tiles that mimic ceramic tile, so you no longer have to sacrifice looks for functionality. There are also waterproof luxury vinyl options available that are the ultimate flooring solution for any home. Luxury vinyl is made to look so real, you and your guests would never guess that your floors are not real wood or stone unless they got down on their hands and knees to get a closer look. Luxury vinyl flooring types we carry include luxury vinyl tile, luxury vinyl planks, WPC and rigid core options. When it comes down to where you can install luxury vinyl flooring, there are almost no limits. If you choose a waterproof luxury vinyl floor, you can install it anywhere in your home including kitchens, bathrooms, basements, and it looks realistic enough for living rooms and bedrooms. If you choose regular water resistant luxury vinyl, you can still install it in places like your kitchen or bedroom but should avoid installing it in places with excessive moisture. Our luxury vinyl selection covers a wide range of styles and types. We carry not only name brands you love but also our very own Carpet One Floor & Home brands such as Invincible™ H2O, Invincible™ LVT, and VERÓSTONE™. Stop by our Avant Garde Carpet One Floor & Home showroom in Waldorf, MD and speak with one of our flooring professionals about luxury vinyl in your home. Why Should I Choose Luxury Vinyl Tile? If the above reasons are not enough to convince you that luxury vinyl flooring is for you, let us give you a few more reasons why. Interested in adding the authentic look of hardwood in your kitchen or bathroom? 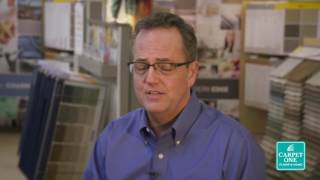 Learn about luxury vinyl plank. Choosing the right type of luxury vinyl flooring for your home can sometimes be confusing. Let us tell you what kind of luxury vinyl would work best for different types of homes. Luxury vinyl flooring is popular because it can handle moisture. As such, it can be installed in kitchens and bathrooms. Compared to other flooring options, luxury vinyl flooring offers tremendous installation versatility. Learn more about vinyl installation.